Carrioles were an important tool for the fur trade, as they allowed trappers to transport supplies and furs throughout the winter. Pulled by dogs, they were sometimes used to transport high-profile people. The example shown here is a duplicate of an elaborate carriole that was presented to Countess Alice Grey, the wife of former Governor General Albert Henry George Grey. 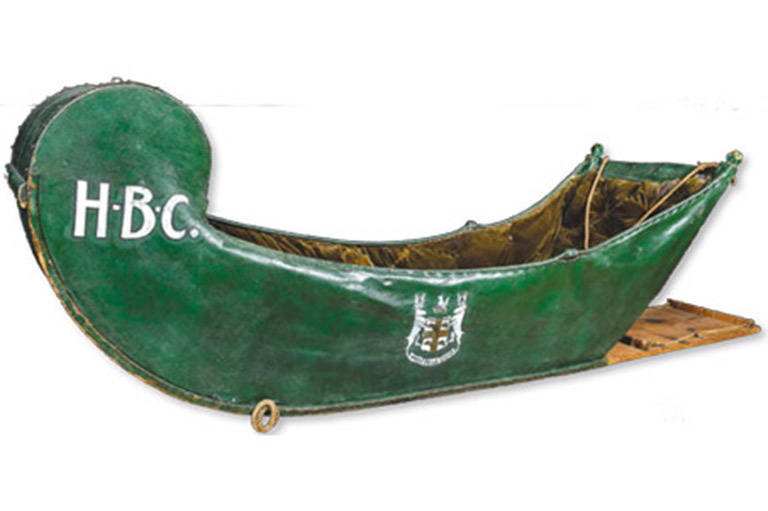 The letters “HBC” and the Hudson’s Bay Company coat of arms are painted on this carriole. The interior is lined with green velveteen cloth, and the back and sides are made from rawhide, which is painted green. Other carrioles were decorated for special occasions, such as weddings, and used to carry the celebrants. The term “carriole” was first used to refer to horse-drawn sleighs, especially the lightweight open sleighs used in French Canada. Throughout the fur trade era, the term described toboggan-style sleds with sides made from hide or canvas and birch boards for planking. This article originally appeared in the December 2015-January 2016 issue of Canada’s History. Folks in our country have come up with lots of odd, innovative, and downright zany ways to transport goods and people.